Jaguars quarterback Blake Bortles (5) plays in an NFL football game against the Pittsburgh Steelers, Sunday, Jan. 14, 2018, in Pittsburgh. JACKSONVILLE, Fla. — He's trash. Subpar. Prone to choke. Blake Bortles is all of these things. At least he is to some of his opponents. Some of his peers. They're not completely wrong. They're not nice, and they might be overstating things, but they're not wrong. They're also not playing in the conference championship game Sunday, at New England. Bortles is. That's all that matters to the Jacksonville Jaguars quarterback, even if he won't view it as validation. "I don't think so. Personally, I do not care," Bortles said this week. "I look at it as it is an incredible opportunity to continue to be able to play football at this time of year." No one will mistake Bortles for anything more than a game manager; especially not this week, when he faces terrific Tom Brady, with the Jaguars' first Super Bowl trip on the line. It's just that the depth and volume of the disrespect shown Bortles is alarming. He's a pleasant guy and a good sport. His only crime is that he hasn't played to the level expected of a No. 3 overall pick, which is where Jacksonville took him in 2014, 29 picks before Teddy Bridgewater and 33 picks before Derek Carr. Bortles has played so badly that he has become so offensive to the opposition that it cannot appreciate what he has become: a competent player who improved enough in his fourth season that he didn't sabotage the real stars in Jacksonville. The Jaguars are a phenomenal defensive line and two Pro Bowl cornerbacks who made the Jags the NFL's top scoring defense. They are head coach Doug Marrone and football operations president Tom Coughlin. They are rookie running back Leonard Fournette. It is Bortles' job to call the plays, not, necessarily to make them. In a league legislated to feature quarterbacks, that repulses players programmed to destroy passers. In early December, after the Seahawks lost in Jacksonville, safety Earl Thomas said Bortles was "subpar." A week laer, after he beat the Texans, defensive end Jadeveon Clowney called Bortles "trash." A couple of weeks later Titans defensive lineman Jurrell Casey predicted Bortles would "choke" in the playoffs, and the Titans weren't even playing the Jaguars. All three players have plenty of supporting evidence. Statistically, Bortles is the least accomplished top quarterback pick from 2010 to 2016. Empirically, he might be worse. But why breed animosity? Why give his teammates the chance to hijack a teammate's postgame interview in order to mock you back? "He's a dog!" Jags defensive tackle Malik Jackson yelled into a camera that was focused on teammate Calais Campbell after the Jags' win Sunday at Pittsburgh. "I want to know what Jurrell Casey has to say about him choking in big moments, while you sit at home and watch us next week!" It was the latest in the team's ongoing defense of Bortles, who ignores the critics but loves the support. "That type of stuff for me is big. What I care about is in that locker room," Bortles said. "When other people say stuff or it comes from anywhere, it doesn't bother me. To see guys within that locker room stand up and say stuff is pretty cool. Those are the opinions that I value." Bortles might never have played to a level that justified the pick, but at least now he's playing to a level that justifies his being in the league. Perhaps the bar should be lower. Every young, pedigreed passer is expected to be the face of his franchise. In an NFL populated by Carson Wentzes, Cam Newtons, Tom Bradys, and Ben Roethlisbergers, it's about becoming that face quickly. Four years isn't quickly. Of the nine quarterbacks selected in the top five picks of the seven drafts between 2010 and 2016, Bortles' passer rating of 80.8 is, by far, the worst; and that includes Robert Griffin III, who didn't even play this season. Bortles' interception rate, 2.9, is last, too. Bortles' passer rating of 84.7 this season would still be worst among the career ratings of the other eight quarterbacks, but he threw a career-low 13 interceptions and had a career-low 2.5 interception rate. Therein lies the reality. Bortles became more educated and more efficient, and so he gave his team more chances to win. The Jaguars won 10 times in the regular season. They won at home against Buffalo and at Pittsburgh in the playoffs. The common thread: The 12-6 Jaguars are 10-0 when Bortles doesn't throw an interception, counting those playoff wins. In their 18 games he has thrown 20 touchdown passes and zero interceptions in the red zone, where his passer rating is 105.6. These days he does less harm. "We talk about the importance of taking care of the ball, and it's obviously important everywhere," Bortles said. "I think the stress of that, once we get in the red zone, is heightened a little bit." 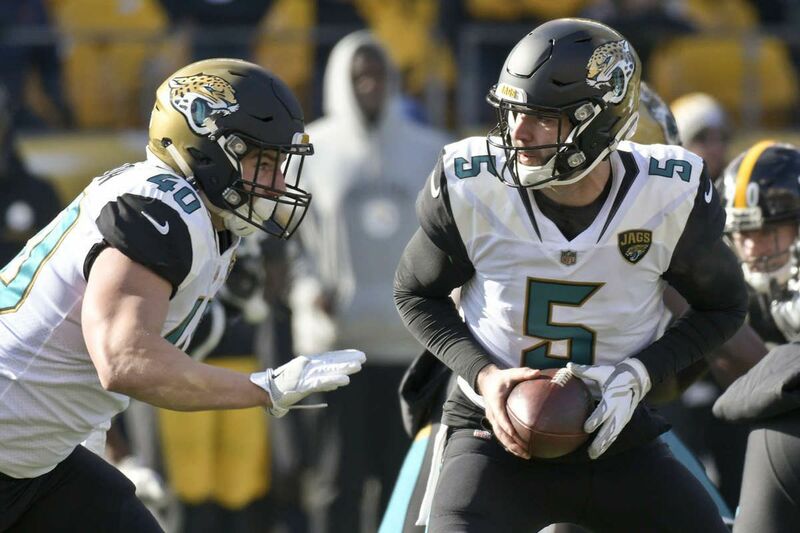 "He's done a great job studying the game plans and understanding what we want to get done, and he's executed it to perfection," said offensive coordinator Nathaniel Hackett, who joined the Jags as Bortles' quarterback coach in 2015. "Blake just understands so much more what we're trying to accomplish." Also, once they get into the red zone, rookie running back Fournette comes alive. He had seven red zone rushing TDs in the regular season and has three more in the playoffs. It's hard to throw interceptions when you're not throwing at all. Fournette's presence in the play-action game keeps opposing defenses from attacking Bortles, too. "The ability to run the ball and you commit to the run" helps Bortles, too, Hackett said. "A lot of the time people just want to go down there and throw." It helps, too, that the unheralded Jaguars offensive line allowed just 24 sacks in the regular season, a franchise record, and two twice in the playoffs. Bortles can run, but he got sacked an average of 46 times his first three seasons. Marrone pointed out that Bortles has had several different voices in his ear — Hackett is his third offensive coordinator — and that Bortles has never blamed his coaches or his offensive lines or his receviers. Bortles shouldn't blame anyone but himself. Greg Olson didn't throw 18 interceptions in 2015, when he was the coordinator. He just called the plays, like Hackett did this season. Nowadays, Bortles is just making more of them. Not enough to silence his critics. Not enough to impress his peers. But enough to bring him 60 minutes from the Super Bowl.